HeatTek offers a variety of Stress Relief Furnaces that include Car Furnaces, Drop- Bottom Furnaces, Continuous Belt Furnaces, Box Furnaces and Tip-Up Furnaces. HeatTek designs include heavy structural steel outer shell and frames, insulation designed for the specified operating temperatures, burners designed for optimal heating and uniformity and fans (when used) designed for optimal delivery of the heat to the product load. Operating temperature ranges extend to 2100°F. All furnaces feature PLC control with an HMI operator screen and can be designed to communicate with plant SCADA (supervisory control and data acquisition) systems. HeatTek Stress Relief furnaces can also be used in many applications including stress relieving (normalizing), tempering, preheating and annealing. 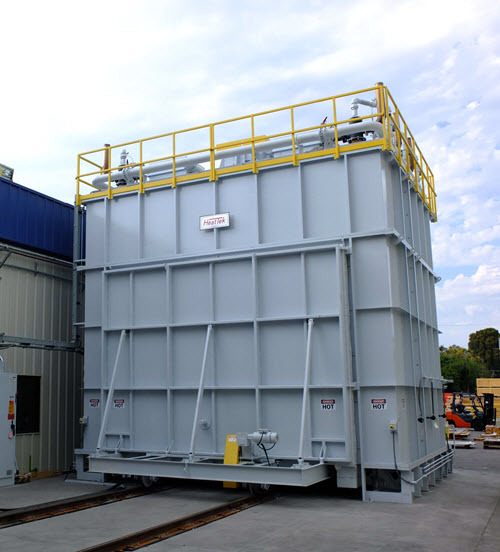 Our furnaces can be found in the gas/oil, steel, heat-treating, aerospace and automotive industries for processing steel, aluminum, titanium and various alloy products. The process of stress relieving consists of heating the product to a temperature below the critical range which relieves residual stresses that have developed during forming processes. HeatTek furnaces are designed to meet these conditions and in the event of higher temperature applications – designs changes are made to meet the specific heat treat temperature range. Gas fired burners and electric heating systems are offered based on the power requirements and product load. HeatTek furnaces are available with single/multi-zone control, gas fired or electrically heated and inert atmosphere capability. HeatTek furnaces are designed, built and tested in our modern 70,000 sq/ft manufacturing facility in Ixonia, WI. Our fully trained and qualified service technicians startup and certify the furnaces to meet national and industrial standards. These include NFPA, NEC, UL, CE and aerospace standards (BAC-5621 and NADCAP AMS-2750E). © Copyright 2017 - 2019 HeatTek Inc.